Email marketers already know that effective email design plays an essential role in branding and has a direct correlation with high clickthrough and conversion rates. However, many marketers overlook the effect that design can have on the deliverability of the actual email message. 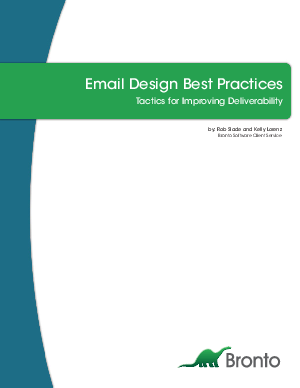 In light of the increasinguse of preview panes, filters and the default blocking of images in popular email clients such as Outlook, Gmail and AOL, Bronto has outlined design best practices that will help you successfully reach your audience.